San Jose pays tribute to Henry Mollicone, the man who is putting the city on the musical map. SJSU becomes the first university to embrace blogging in a literary series when Salam Pax arrives March 23. Meet the Baghdad Blogger. The Fly: Did frontrunner DA candidate Karyn Sinunu flip-flop during last week's district attorney debate at City Hall? Silicon Alleys: Someone needs to do for San Jose what Naguib Mahfouz did for Cairo, what Kafka did for Prague or what James Joyce did for Dublin. Techsploits: If you sign up and download a plug-in for Firefox, Root Vaults will record your entire clickstream, including Google searches and things you've bought online. Rev: Hydrogen can be made by electrolysis: splitting water. And the energy for this process could come from wind or solar power. Mining for Oars: 'Summer Storm' offers conclusive proof that teens have an easier time in Germany. No Sleep Till Austin: At SXSW conference, the key to longevity in the music business is to do what you love and love what you do. Alone Together: Rock reflects the singular in the collective. 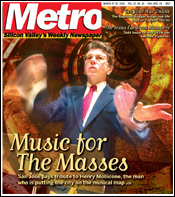 Mining Mozart: Symphony Silicon Valley and conductor George Cleve gave Opera San José's best voices a workout in Mozart program. 'Election' Author Wins Readers: Novelist Tom Perrotta comes to Montalvo literary series bearing his 'Little Children' and other bestsellers. House Rules: Santa Clara's House of Soul Food is the South Bay's best Southern cooking. Live Feed: It's Raining Menus. Please don't forget to write! Metro welcomes letters. Like any great work of art, they should be originals  not copies of letters sent elsewhere. Include address and daytime phone (for verification purposes only). Letters may be edited for length and clarity or to correct factual inaccuracies known to us. Postal: Metro Letters, 550 S. First. St., San Jose, CA 95111. Fax: 408/298-0612. Email: letters@metronews.com. Emailers, please include name, city of residence and phone number. Letters printed will list email address unless otherwise specified. Letters to the editor are not currently published in the online version of this paper.